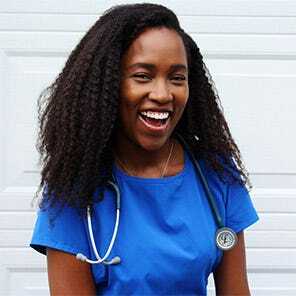 Shanice M. is a medical student who moved from New York to California for medical school, though her family is originally from Jamaica. A true leader amongst her peers, Shanice is on Medical Student Council as the Medical Education Committee representative for her class, as well as coordinating mentorship activities through her role as a MAPS Co-Coordinator in Student National Medical Association (SNMA). In her free time, Shanice enjoys blogging, cooking, and going to the beach! "Medicine is truly about life long learning and building that foundation as a medical student has been so rewarding. I'm constantly amazed by what our bodies are capable of and the many factors that contribute to our health. I truly feel that becoming a physician is more than just a job and I'm so grateful that I will be able to dedicate my life to helping others. To me, professional style does not have to mean boring or stuffy, nor should it make you think to yourself "Well, I guess I have to wear this." Professional style is aesthetic, functional, and comfortable. It makes you feel good while you do the work that is required of you. Scrubs are notoriously unflattering and it's difficult to strike that balance. I believe that Medelita embodies professional style in the health care workplace." Follow Shanice on Instagram and visit her blog at PurelyPosivititea.com!